Chaplain Royal Carleton spent his Labor Day calling together churches of different denominations after finding hateful messages taped to the door of his building. 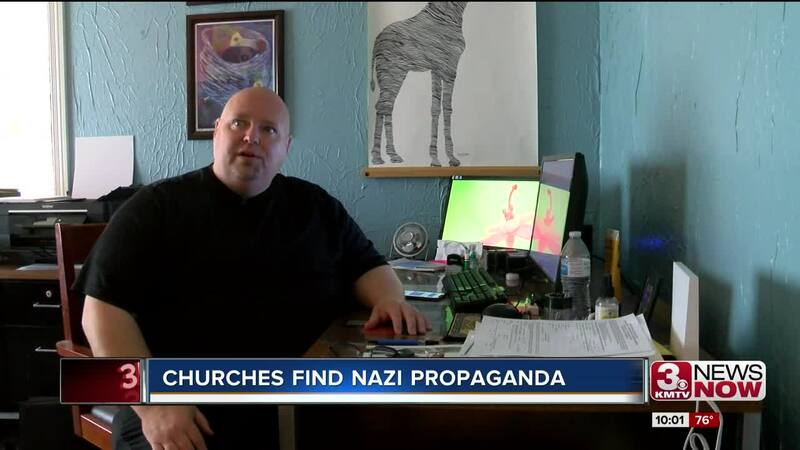 All of them posters containing Nazi symbolism. Five religious organizations across Omaha found the posters on their properties. Royal is now reaching out to other church leaders to find a course of action against whoever is at hand. "I think that our job is to have a dialogue and make sure that we talk about this because if we're shocked this is on our front door, what's the average citizen that lives down the street thinking?" Carleton said. Jeannie Murphy-Matthews worships at Unity Church, another organization that encountered the Nazi propaganda. Murphy-Matthews hopes anyone with these beliefs come to her place of worship for guidance. But after seeing other divisive messages in the city , she says Omaha isn't going to stand by. "People aren't going to stand for this, but here in the Midwest, we are not used to that so when we see that in our own backyard we are called to action," Murphy-Matthews said. The flyers come from the extremist group called the Atomwaffen Division. The Southern Poverty Law Center defines the Atomwaffen Division as a socialist and terrorist organization. Chaplain Carleton has only one message for the group behind the hateful flyers--whoever they might be. "I hope you find the peace and help you need that it doesn't fit in our community and it's not worth it," Carleton said. The other churches finding the flyers include United Methodist Church, Metro Community and Second Unitarian. Carleton hopes to hear from them first thing tomorrow.